The new season of “Who Do You Think You Are?” will begin soon. Another popular genealogy TV show, “Finding Your Roots”, is on hold. There isn’t any way to know when that season might air (if at all). The reason has to do with something that happened in the previous season of the show. Originally, the new season of “Finding Your Roots” was planned to air shortly after season three of “Who Do You Think You Are?” ended. “Finding Your Roots” was supposed to have season 3 start airing in September of 2015. However, that date has been delayed, indefinitely. The delay is not due to an inability to complete the filming of the episodes. They are all done. The upcoming season was set to feature Patricia Arquette, Lidia Bastianich, Richard Branson, Donna Brazile, Ty Burrell, LL Cool J, Mia Farrow, Bill Hader, Neil Patrick Harris, Dustin Hoffman, Jimmy Kimmel, Normal Lear, Maya Lin, Bill Maher, Julianna Margulies, John McCain, Julianne Moore, Azar Nafisi, Bill O’Riley, Shonda Rimes, Maya Rudolph, Gloria Steinem, Kara Walker, and Keenen Ivory Wayans. The problem causing the delay of the new season stems from something that happened during the previous season of “Finding Your Roots”. Ben Affleck was featured in one of those episodes. As fans of the show know, the celebrities are not told what genealogists found out about their ancestors before the episode is filmed. The information is revealed “live”. There was some controversy surrounding the episode with Ben Affleck. The genealogists revealed that one of his ancestors was a slave owner. The episode aired without that information in it. Later, it was revealed that Ben Affleck urged the producers of the show to exclude that information because he was embarrassed about it. Instead, his episode focused on his mother who was a member of the Freedom Riders, and on another ancestor who fought in the Revolutionary War. As a result, PBS, the channel that hosts “Finding Your Roots” did an investigation. 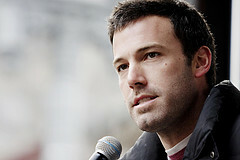 They concluded that the producers violated network standards by giving Ben Affleck “improper influence”. PBS also felt it was not informed about Ben Affleck’s influence on that episode. Staffing changes have been made. They added a fact checker and an “independent genealogist” who are going to review all of the episodes of the new season before it will air. Right now, it is unknown if there will be a fourth season of “Finding Your Roots”. It is a unique situation where the “cover up” was “worse than the crime”. PBS is removing the episode that featured Ben Affleck from distribution. It is unlikely that people will forget about his ancestor that he tried to hide. Image by Erin on Flickr.